One way campers have some great Cairns Campervan Hire deals on right now! Our depot is located close to the airport in Cairns, so therefore easy to fly in and pick up a camper! We offer unbeatable deals on Cairns Campervan Hire back to Sydney. Call 0412766616 for more details of our offers! We will beat all competitor quote for Cairns to Sydney camper hire! One Way Campers Cairns to Sydney Campervan Hire Price Match! One Way Campervans offer unbeatable Cairns Campervan Hire deals! OWC will match any Cairns to Sydney Campervan Hire quotes for bookings longer than 14 days. Call our team on 0412766616 and we will beat any competitor quote as long as we have vehicles available. Note – this does not apply over the peak Easter or Xmas period when everyone sells out. 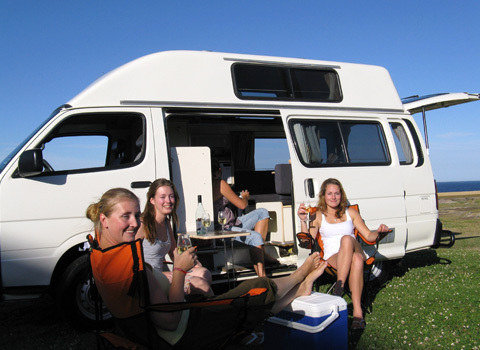 One Way Campervans are specialist in Cairns to Sydney Campervan Hire. We will price match all deals with our competitors for Cairns to Sydney Campervan Hire! All you have to do is to click here to send OWC’s Cairns to Sydney price beater email with your quote. We will do our very best to match all competitors deal for you! Remember we only price match on similar vehicles, ages, quality and if we have availability. If we have the campervan in stock at our cairns campervan hire depot, then you can have a great deal if you are travelling back to Sydney. OWC Cairns Campervan Hire branch have different vehicles for hire from Cairns. We have something for the budget conscious traveller looking for a cheap campervan hire deal back to Sydney. We also have vans for those looking for automatic campervan hire. Call our team in Cairns on 0412766616 for our latest offers, short term specials and last minutes deals back to Sydney. Our Cairns Campervan Hire depot is located conveniently close to the airport. It’s very easy to fly into Cairns and rent a campervan within an hour of landing! Check out Travelwheels Cairns Camper Hire – click here to view our specials! Below is a list of local facilities close to the OWC Cairns Branch. We are only a short distance away in a taxi from the airport. Question = Nearby hostel? Price range? Campsite close to Cairns to park your campervan. If you need to find a camping site close to cairns, here are three recommendations for you. The first one is close to the city centre and it has water slides, splash park and more cool stuff. This one is called Coconut Holiday Resort and well worth investigating. If travelling from the north back to Cairns, then check out the lovely Ellis Beach Caravan Park. The Lake Placid Tourist Park is great for anybody wanting to explore the rain forrest nearby. Cairns is considered the gateway to the Great Barrier Reef. Below are some useful links for those visiting Cairns for the first time. Here is a useful link from our customers listing free things to do in Cairns. Our customers also recommend reading top ten activities to do in Cairns whilst lists some cool stuff to do. In the meantime, here are some more useful links to check out….. First up is the Lonely Planet web page on Things to do in Cairns. Here is another link from Australia.com which lists the top ten things to do in Cairns. Trip advisor can be another good source of information and here is their page on things to do in Cairns, Australia. Here is our Cairns Campervan Hire FREE Cairns to Sydney roadtrip route planner or with helpful tips you can download. Remember we always have different special offers for Cairns to Sydney campervan hire. You can email our team at one way campervans or call us on 0412766616. Send us an email by clicking for cheap cairns camper hire deals and remember you can write in English, Deutsch or Français.